It has been a little more than one week since I had my last day at work. Now I’m officially just a student again. This is pretty weird, as I’ve worked at XING for almost one year. My last day has been a real tearjerker for me; so many of my nice colleagues came and said goodbye (and ate ALL the cupcakes and cake pops I brought – that has never happened to me before. People usually don’t seem to be half as excited about cake as me). Though I’ll (hopefully) be able to see my boyfriend more often now (as I don’t just have the weekends for visiting) I’m really really sad I won’t see my lovely team every day anymore… It was so great working there and, of course, especially working with my colleagues. But that also means I have a little more time than before, which is why I’ve decided to visit my parents for a few days. And THAT means there is, at last, enough space and light and a „real“ camera to shoot food! I immediately took advantage of those four resources – time, space, light and a good camera – and shot the birthday cake I promised my dad in January. My dad loves After Eight (thin mints) since, uhm, always? At least as long as I can remember. Every Christmas, my mom prepared a plate for him and put it under the Christmas tree. 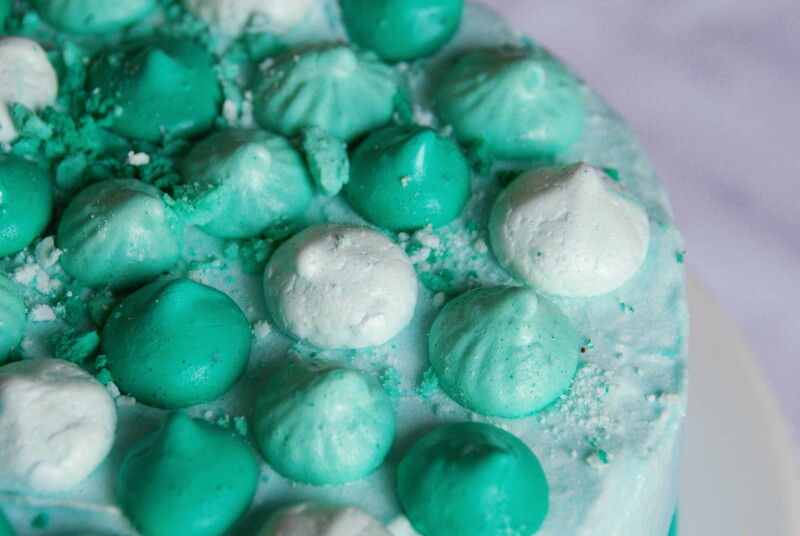 There were his most favorite candies on it, so of course, mint thins or mint patties, too. We called it „Der süße Teller“. I think this precisely is why I developed a taste for mint candy as well, because I don’t really know anyone else who likes the choc-mint-combination or who at least doesn’t give me a disbelieving look when I order mint chocolate chip ice cream instead of vanilla. 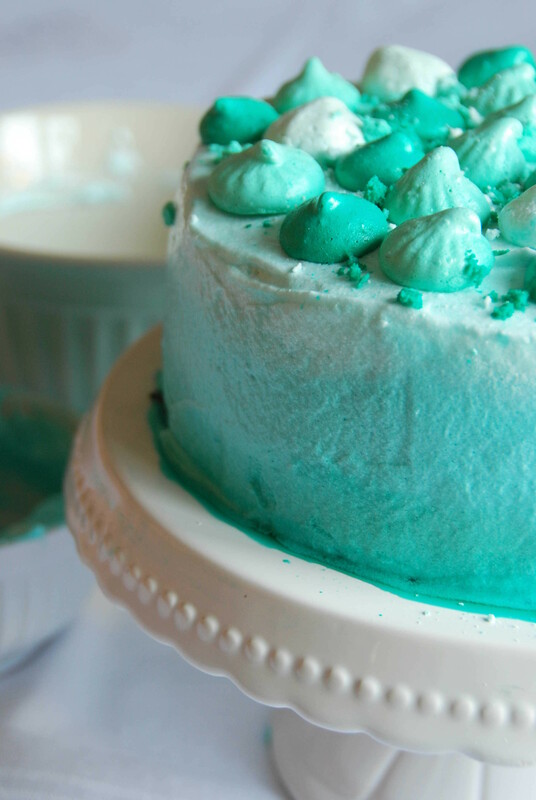 This is also why my dad might be the only person I could bake a mint cake for, so I did. 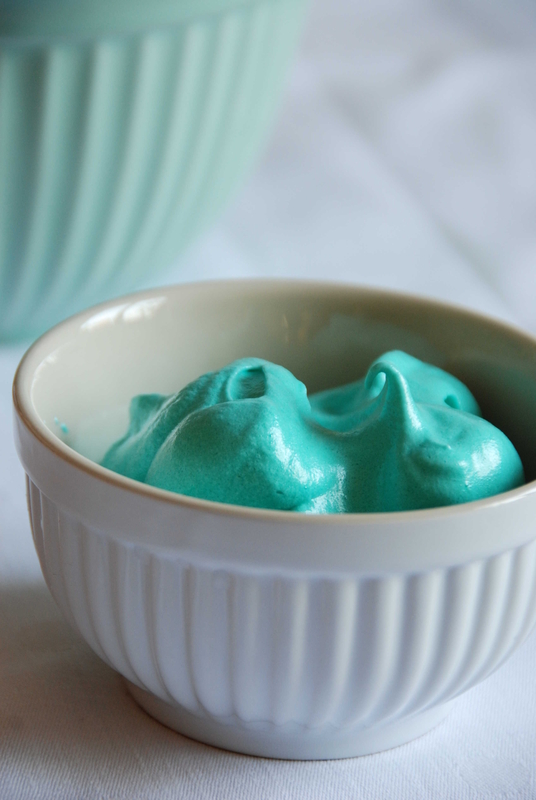 I haven’t made anything mint before and I didn’t know how to flavor the stuff. I knew there was peppermint oil, but it has a really sharp taste and basically smells like toothpaste. 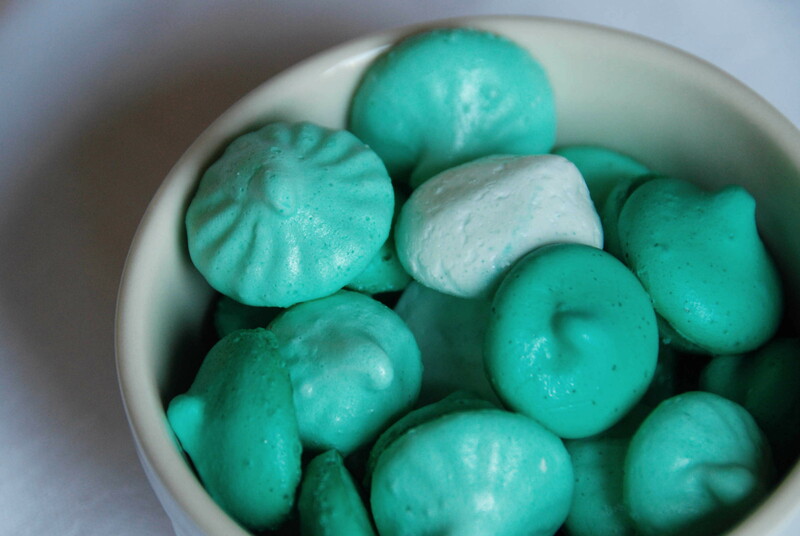 Turned out that this actually is what you use for mint candy, though you have to dose it really carefully. 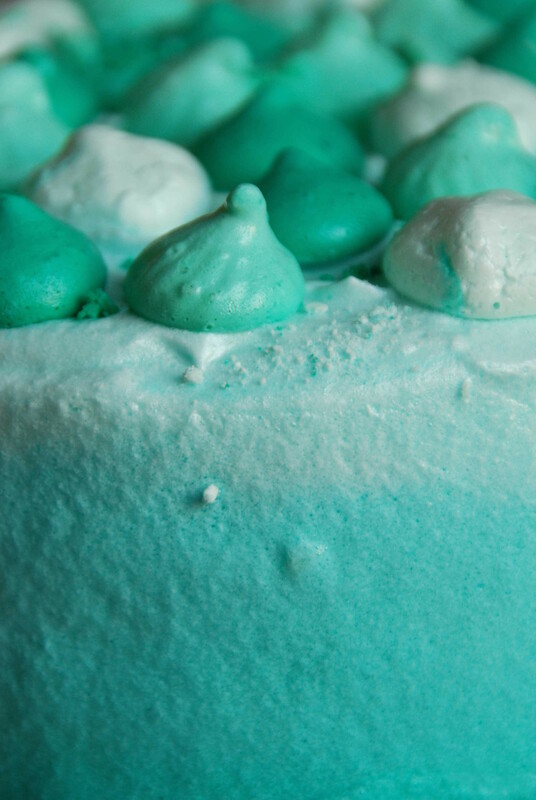 For the whole cake (mint meringues and mint swiss meringue) I used an estimate of about two drops. Measured with the tip of a toothpick. So, be careful, or you’ll get a toothpaste cake instead, and you’d probably don’t want that. If you do, though, you’d actually do better with peppermint oil than with real toothpaste. In the end, the oil had two jobs: 1. I used it for flavoring the cake and 2. it helped curing my cold. Boohoo! By the way, aren’t these bowls really nice? I know. 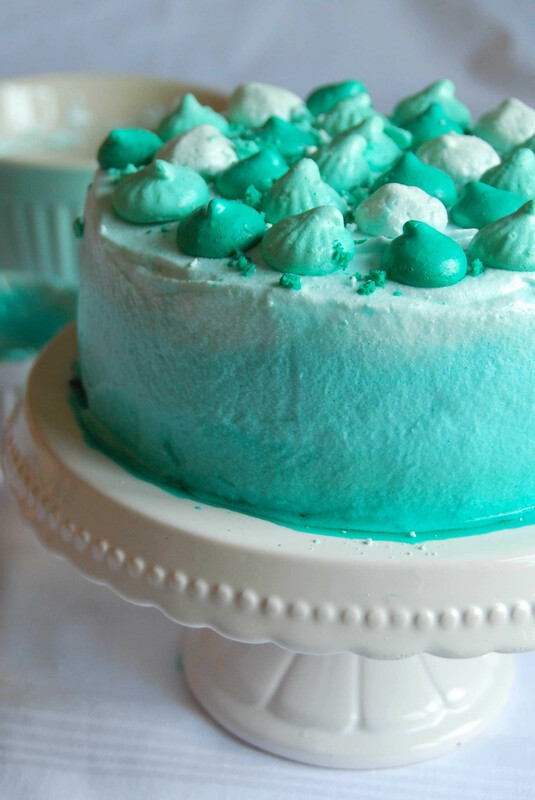 I went with three teal shades of swiss meringue frosting to make an ombre cake, and for just meringue frosting instead of buttercream because I thought a lighter frosting would go better with the minty taste. 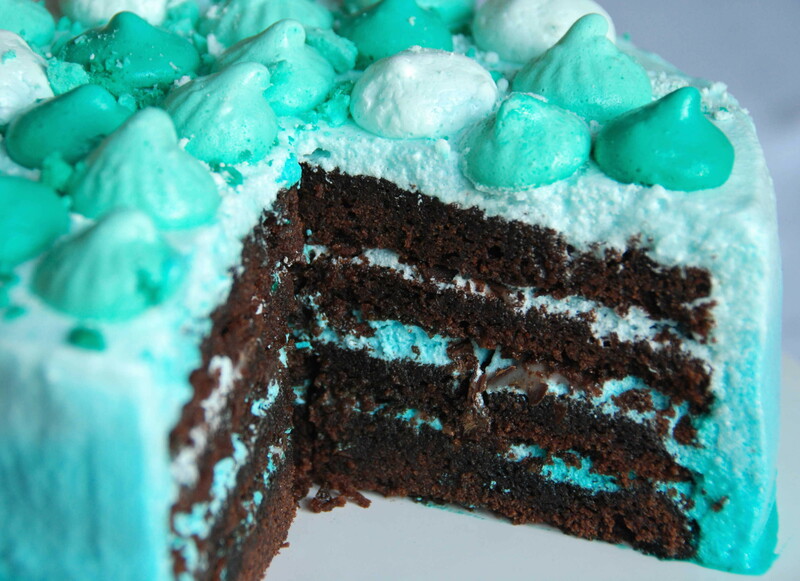 The frosting is layered with thin mints and covered with little shaded mint meringue drops (and crumbled ones) on top, piped with three different icing tips. That’s pretty much it! The cake base is my go-to Devil’s Food Cupcake recipe for 17 cupcake baked in two small 18cm pans. I colored the meringue with Wilton gel colors. DO NOT DO THAT! I totally regret it. 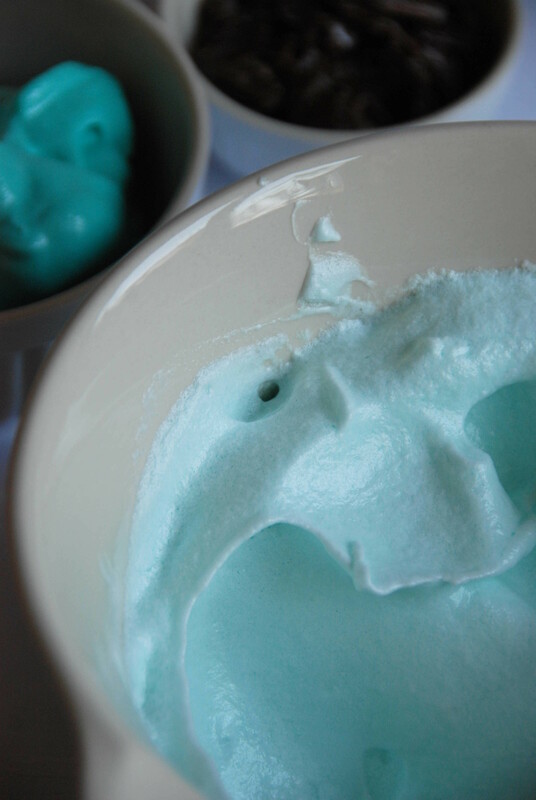 Gel colors are my go-to-colors, but it seems for meringue you should switch to powdered coloring. The heavily tinted meringues on top got sticky and didn’t dry as good as the nearly white ones. 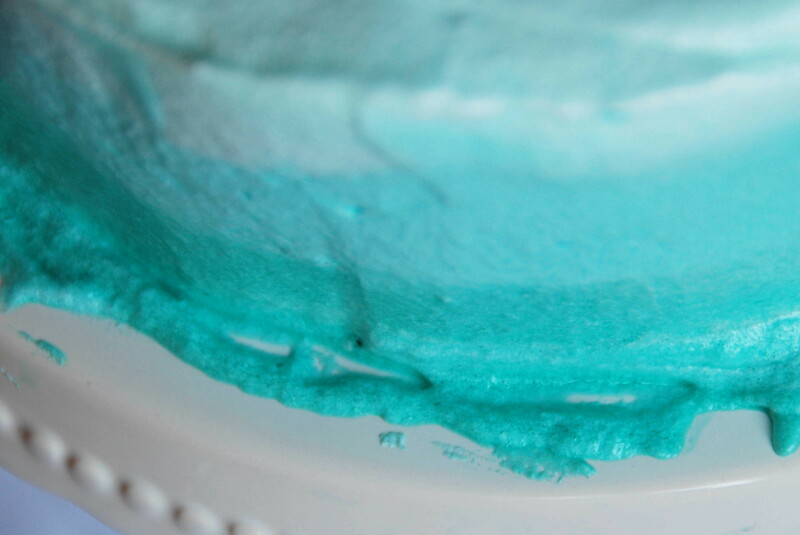 And about to hours after the cake was assembled, the color kind of sogged out of the swiss meringue frosting a little. It wasn’t too bad, but I think it can be made prettier by using powdered colors. I haven’t tried it yet (total mint overdose from curing my cold, I think at the moment I can’t really associate the flavor with food), but I do believe what my dad says is true, at least it’s a good sign that he had already eaten a quarter of the cake after three hours. Preheat your oven to 90°C. Whisk the egg whites with the salt, begin slow, then beat on high for about a minute. When the egg whites turn glossy, slowly add the sugar one tablespoon at a time and beat until not completely stiff peaks form. Color that stuff: Divide by thirds. Color one third the lightest shade of teal, the other ones getting darker each. Fill each third into a piping bag and use different tips if you like. Open star tips look great. Pipe the meringues onto a baking sheet lined with parchment paper and bake them for one hour, after one hour turn your oven down to 50° and bake until dry to the touch. Heat up egg whites and sugar over a bain marie until they reach 70°C. Meanwhile stir so that the whites don’t scramble. Then beat the egg whites until soft peaks form. Divide into half, divide one half into half again. 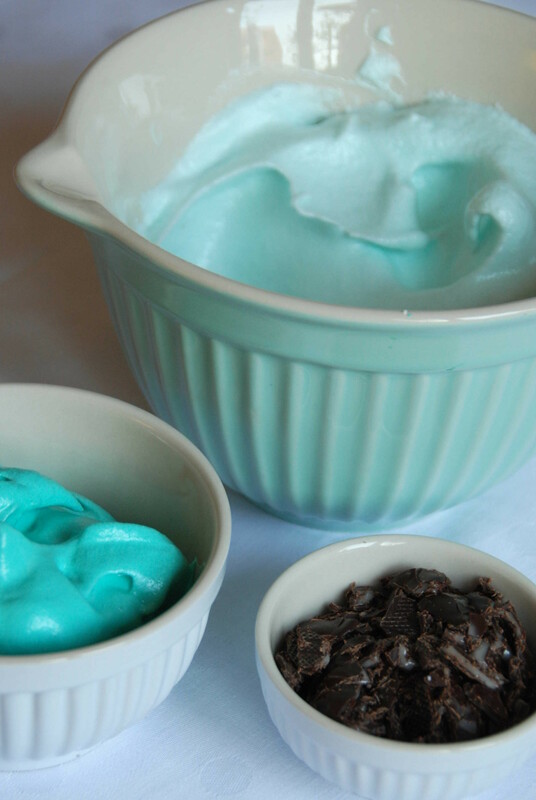 Color the biggest portion in light teal, color the other smaller portions darker each. From the darker shades, take away one half each and (seperately) mix in one toothpick tip of peppermint oil. Take away one third or quarter from the lightest portion and flavor it aswell. 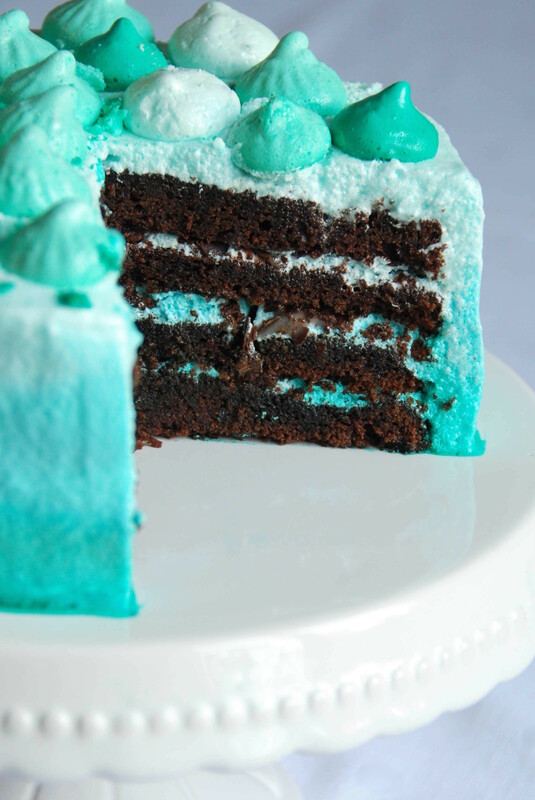 Layer the cake with the flavored meringue frosting (the bottom one with the darkest frosting, then the lighter one on the second layer and the lightest one on the third) and crushed thin mints each. Cover the cake with the unflavored frosting, dark to light from the bottom, and straight it with a spatula. Assemble the meringue drops on top and chill until served! 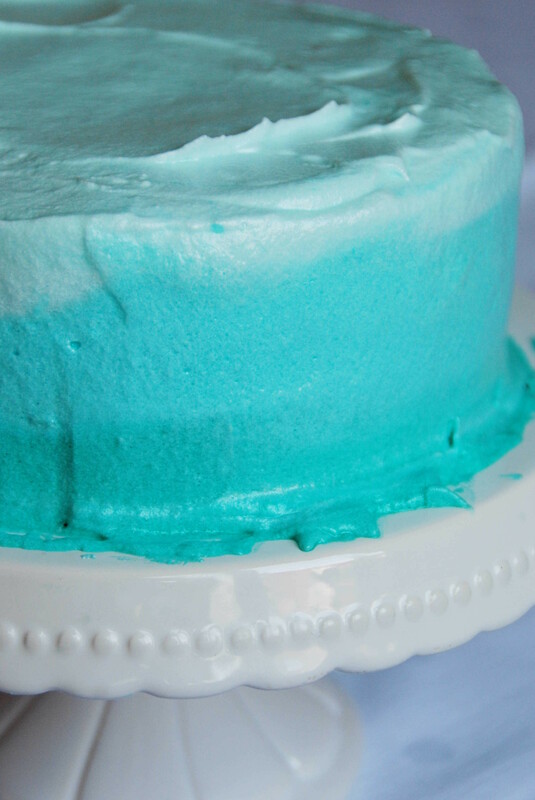 For a great tutorial on how to make ombre cakes, visit Style Sweet CA’s tutorial.